This Instructors package is used by many of Canada’s largest companies, is industry recognized and can be fully customized to your classroom and workplace setting. This package is to be delivered in a basic four-hour course and is laid out in a what-to-say, what-to-do-format. The content can be easily expanded for longer sessions using the extensive supplementary information, exercises and discussion guides. The instructors manual is cross referenced to the TDG regulations and TDG Handbook for easy follow-along. The included video compliments the PowerPoint presentation and seamlessly ties the video content to the flow of the course. Students will be actively engaged in the learning process as you present the information. This package now includes 8 student handbooks! And there’s more! You will receive a 20% off coupon code with your Instructors package for future TDG Handbook purchases. 1 Year Electronic TDG Update Service. A $60 value! 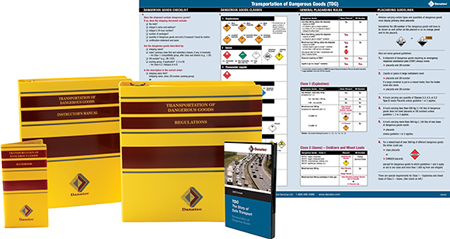 This course material was prepared in accordance with Transport Canada's Dangerous Goods Advisory Note "TP 9554 E" (Guidelines for Training Criteria for the handling, offering for transport and transporting dangerous goods by road).